Along with Stanley Kubrick’s 2001: A Space Odyssey (1968), Andrei Tarkovsky’s Solaris (1972) is one of the best examples of the successful blending of hard science fiction with philosophical and spiritual musings. Both films are towering epics released within four years of each other. Normally, when one thinks of Russian cinema it is of the stereotypes: long running time and a cold distant approach. While Solaris is certainly a long film, it is anything but distant. When ground control receives mysterious transmissions from the only three inhabitants on the Solaris space station, they send cosmonaut and psychologist Kris Kelvin (Banionis) to check it out because the powers that be believe the people on the space station are experiencing hallucinations from unknown phenomena. He arrives to find the station in disarray and Snaut (Yarvet), one of the inhabitants, acting twitchy. He tells Kelvin that one of them has committed suicide and that Sartorius (Solonitsyn) has also gone crazy. Kelvin tries to figure out what went wrong and begins to experience hallucinations in the form of his deceased wife Hari (Bondarchuk). She committed suicide awhile ago and Kelvin is still dealing with feelings of grief and guilt. He knows she’s not real but still finds himself under her thrall and desperate to redeem himself. Like Kubrick, Tarkovsky favors long takes, deliberately slow pacing and employing a widescreen frame to depict the unfolding drama. Solaris is the cinematic equivalent of a mood ring as Tarkovsky alternates between a cold blue look and a warm, sun-kissed look that depends on the kind of emotion he wants to convey. He also alternates between black and white and color film stock. Five years before Star Wars (1977), Solaris features a lived-in future world that flies in the face of the sterile look of 2001. Like Kubrick’s film, it is a meditative take on science fiction, investing the genre with deep emotions and intelligence as Tarkovsky wrestles with notions of identity and humanity as personified by Donatas Banionis’ haunted, soulful performance. Many years later, Steven Soderbergh made his own version of Stanislaw Lem’s novel in 2002 but his approach was closer to Kubrick’s vision of science fiction than Tarkovsky’s. The Russian film remains one of the undisputed masterpieces of the genre and this new edition, by the Criterion Collection, is a fitting tribute. The first disc features an audio commentary by film scholars Vida Johnson and Graham Petrie, co-authors of The Films of Andrei Tarkovsky. They talk about a few of the Russian filmmaker’s key collaborators who worked with him on several films. Johnson touches upon the relationship between Tarkovsky and his lead actor, which lacked in communication at times. Petrie examines the differences between the source novel and the film. There is a nice mix of analysis and production information on this track. The second disc includes nine deleted and alternate scenes. We see more of Kelvin and his dead wife Hari. Some of these scenes flesh out the character of Kelvin but one can see why they were removed. Actress Natalya Bondarchuk is interviewed and talks about when she first met Tarkovsky and her impressions of him. Interestingly, she had already read Lem’s book. She speaks admiringly and honestly about her performance in the film. Cinematographer Vadim Yusou is interviewed. He had worked with Tarkovsky on several films, including his grad film. He offers initial impressions while talking about the Russian filmmaker’s working methods. 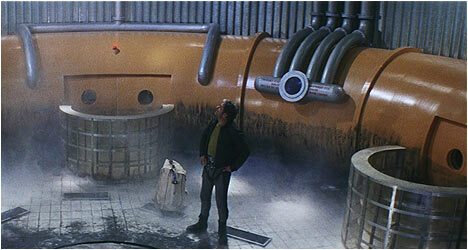 Yusou also talks about Tarkovsky’s intentions with Solaris. The film’s art director Mikhail Romandin is interviewed. He talks about meeting Tarkovsky for the first time. He tells some engaging anecdotes about how poor they all were back in the day and, naturally, about his work on Solaris. In an interview with composer Eduard Artemyev, he talks about his first meeting with Tarkovsky and how he went about composing Solaris’ unique soundtrack, utilizing the then emerging electronic music. Finally, there is an excerpt from a Polish documentary about Stanislaw Lem who did not like Tarkovsky’s take on his novel. While the film placed an emphasis on Earth, Lem was interested in outer space.